Rubin: My Hockey Picks Weren’t Exactly Correct, but Close! It was one crazy weekend in College Hockey. Did anyone see AIC winning? How about Brown getting shut out? Noontime Sports columnist, Dan Rubin attempted to make a few suggestions in regards to this past weekends college hockey scores. However, things didn’t totally end the way he had hoped, right? When I picked the Seattle Seahawks to beat the New Orleans Saints in the NFL playoffs, everyone that I knew at the time looked at me like I was insane or crazy. When I picked 15th-seeded Hampton to beat 2nd-seeded Iowa State in the 2001 NCAA men’s basketball tournament, I got looked at like I wasn’t speaking English. And when I picked Cornell last year to make the sweet sixteen, people really thought something was incredibly wrong with me. Needless to say, I picked all three. The problem is – I didn’t pick anything else correctly. I finished dead last in my pick ‘ems for every single year even though I picked the best upsets and runs. My ability to picking games is so horrendously bad sometimes that when I make an insane selection, it pans out…and nothing else does. So far, the 2011 NCAA men’s hockey postseason is shaping up to do the same thing to me. To recap, this past week I picked the following teams to win their hockey playoff matchups. I had Niagara, Bentley, Army, and Mercyhurst all moving on in Atlantic Hockey. I picked Brown to extend Quinnipiac to three games in ECAC, and I picked my upset special of Harvard over Clarkson in three games (also in ECAC). The lesson? Dan Rubin knows nothing. So what did this weekend teach us? Sacred Heart finished 11th in Atlantic Hockey yet isn’t the worst team to advance. The Pioneers trailed Bentley 3-1 in the second period before scoring five third-period goals. Sacred Heart’s forwards were a lot better than I gave them credit for. Matt Gingera had a hat trick with all three goals coming during the Pioneer comeback. He scored the game-tying goal at 10:41, the insurance goal at 12:24, and the empty-netter with under a minute to go. I also was completely wrong about Olivier St. Onge, who stopped 42 shots, including 17 in the 2nd and 15 in the 3rd. Bentley outshot Sacred Heart, 45-28, but they went 0-7 on the power play. But they’ll go to second-seeded Air Force because AIC did what everyone knows they can do – play a team hard. AIC might not have the most talent, and they might not have the most storied program, but they play EVERYONE tough and can steal one or two games. They beat Army pretty handily, but now they’re forced to go to RIT for the quarterfinals. Everything I worried about Brown came true. All the problems for Brown came to a head in this weekend’s games. They needed freshmen defensemen to play over and above what they were, and it didn’t happen. They needed Mike Clemente to play like he did against Yale in last year’s playoffs, and lightning didn’t strike twice. And the middle lines couldn’t help Brown, since the offense didn’t garner a single goal. They’ll be a lot stronger in the coming years, and they’ll be a force to be reckoned with, but this weekend just wasn’t their time. Harvard saved my weekend picks. Harvard didn’t overpower Clarkson, but they did what they needed to do to win. Danny Biega (my X-factor) had a goal and two assists on the weekend, while his brother Michael had a goal in each game to go with an assist in Game 2. Michael Biega also scored the game-winner in both contests. So while the Biega clan isn’t winning any Hobey Baker trophies, they’re still worthy of some mention of their talent. “You are still dangerous.” – Iceman (Top Gun). Mercyhurst in the playoffs is a pretty good team. Of all second round matchups, theirs is the most favorable because they draw Connecticut. They beat a solid Robert Morris team and now travel to play a UConn team that benefitted from playing in the eastern scheduling pod. I wouldn’t be surprised to see the Lakers make it back to Rochester for the conference final four. I’m using Magic 8 Ball for this week’s picks. For a guy who watched a ton of college hockey this year, I did pretty horrendous at 2-4. But it’s pretty true to what I usually do. I called a couple of upsets but dropped the ball everywhere else. And that’s heading into a Hockey East playoff that’s anybody’s hockey tournament. So I’m breaking out my trusty Magic 8 Ball to help me out this week. Stay tuned for all the hockey previews as we gear up for the weekend of the quarterfinals. The last weekend of the season didn’t disappoint for Atlantic Hockey. With seeding and playoff positioning hanging in the balance, teams came through in a big way while others slid down the playoff standings. Bentley lost to Holy Cross on Friday, and then trailed for 50 minutes of Saturday’s game at home. But Bentley battled back to tie, with senior Jeremy Robert, who played only sparingly during the regular season to this point, scoring with his net empty. They gained a point, but they needed a win to get the nine-seed. So, despite the comeback, Bentley slid to the 10-spot. The tie cost the Crusaders a chance at the #2-seed, since a win would’ve potentially moved them ahead of Air Force. The one-point weekend for Bentley cost them a) a first-round bye, b) a chance at a quarterfinals series at home depending on how the first round decisions fared, and c) the top seed of first round eastern division teams. Meanwhile, Robert Morris entered the weekend entrenched as that two-seed, needing one win over Air Force to sew up that slot. Instead, they got swept by Air Force, falling not only out of the two but into the lowest seeded home slot in the western division, going from two to five, where they now host seventh-seeded Mercyhurst. By virtue of the four point weekend, Air Force managed to a) get a first round bye, b) sew up the second seed, and c) guarantee a quarterfinals series against a low-seeded team that won’t want to make a 2,000 mile journey west. Sacred Heart, meanwhile, took a surprise game from Army on the season’s last day to vault one point over AIC. That sets up a rematch in the first round of an 8-2, Sacred Heart shellacking victory over Bentley from earlier this year, where both teams could have finished easily nowhere near each other in the standings. 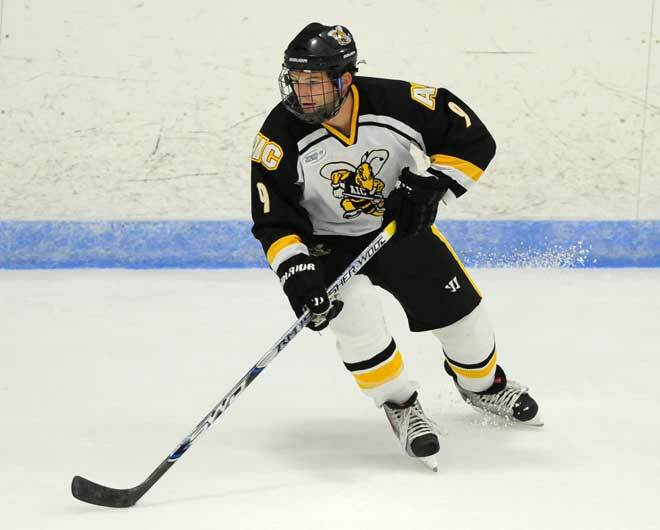 AIC was swept by Connecticut, giving the Huskies the bye and the Yellow Jackets the basement. And with that, we’ll take a look at some of the rest of the final weekend games, as we preview the AHA Playoffs. RIT wins the regular season crown and #1 seed in the playoffs. Air Force garners the #2 seed and first round bye in the west. Meanwhile, Holy Cross gains the #3 seed and a first round bye, while Connecticut finishes second in the east, earning a bye as the #6 seed. Despite their bye, the Huskies are on the road in the second round when the final ten reseed, unless either Robert Morris or Niagara loses their first round game. Tale of the Tape: The road team won every meeting between the two teams this year, with the Purple Eagles getting the head-to-head advantage. Niagara also enters this game with the top two leading scorers in the league. Paul Zanette and Brian Haczyk scored 29 and 27 goals respectively. Zanette also finished second in Division I with just over 1.5 points per game. So Dan Morrison is going to have his work cut out for him in net for the Golden Griffins. Morrison ranks 11th in the conference in save percentage, but he also averages over three goals per game allowed. That differs greatly from the platoon of Chris Noonan and Cody Campbell. Noonan ranks 6th among netminders in the league, but he only appeared in 13 games. X-Factor of the Weekend: For Canisius, it’s Cory Conacher. This is Conacher’s swan song after playoff disappointments in each of the last three seasons. He scored 18 goals this season to lead Canisius, where nobody else scored 10. He has 61 career strikes and 141 career points. In a one-game series, he’ll need to match Zanette and Haczyk almost single-handedly. Prediction: Conacher’s a great talent and rightfully deserving of Hobey Baker mention, even if he shouldn’t win the award. But it’s a case of Niagara and the old CHA being too strong. 4-1 Niagara. X-Factor: At this point, it’s coaching. Derek Schooley is the only head coach Robert Morris has ever known in its short history. This is the first over-.500 season for the team in their first year in AHA. Rick Gotkin has been here before, piloting Mercyhurst since the program’s 2nd season of Division III hockey in 1988. He’s also taken the team to three NCAA Division I tournaments, most recently in 2005. In 2009, Mercyhurst upset RIT in the conference final four, only to lose to Air Force. Plus, he’s a really nice guy. Tale of the Tape: AIC is a bad program that plays everyone tough. They beat Air Force, swept a weekend at Mercyhurst, beat RIT at home, and crushed Bentley on the road. But they were swept by the Knights (allowing 19 goals in the process), and they followed up their win at Air Force with a whopping 12-0 loss. They give up a lot of goals. Army beat UMass, Niagara, Air Force, and RMU. With a win, they go to Air Force. They’re probably the only team salivating at the chance to make that trip since intra-service bragging rights are involved, and there’s no Navy in D1 hockey. An AIC win sends them to RIT. X-Factor: Which AIC team shows up? I have no idea how they went [7-22-1] and [7-19-1] in conference. I still can’t figure out how they beat RIT, Air Force, and Mercyhurst. But I watched them beat Bentley into submission. They deserve better than the 12-seed. Prediction: If AIC were playing Bentley, I’d actually consider teasing them for a win. I’ve made stranger picks. But Army has the Jackets’ number. My heart wants AIC to win, but my logic says 5-0 Army. Stay tuned for tomorrow’s Bentley-Sacred Heart breakdown as we get you set for the local team’s march towards the Blue Cross Arena in Rochester.